Danielle has flawless taste and if she hasn’t already gone into event planning, she certainly should be considering it. (I’m sure you’ll agree once you see all of these amazing images of her wedding.) She was so passionate about all of her incredible details and yet, so open and welcoming to the the ideas that I brought to her & Kurt’s day at Brasada Ranch this past June. We decided that we wanted to honor the dusty tones of our native high desert landscape in their florals, then she geniusly added dove grey accents in her table linens and candles which perfectly complimented the whole look. 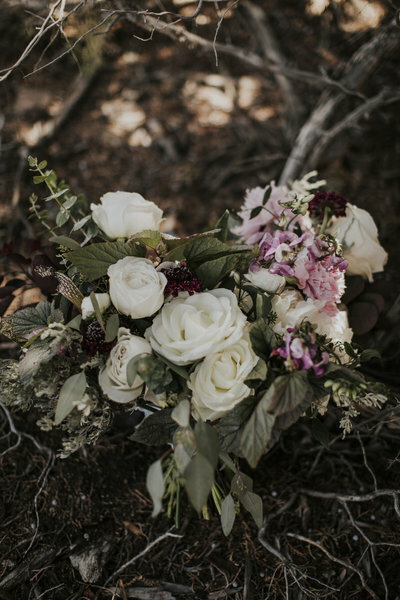 The ingredient list I chose to bring Danielle & Kurt’s visual aesthetic to life was a mixture of full romantic roses, enormous local peonies, seasonal smoke bush (the champagne fluff you see), desert sage, and a variety of fragrant eucalyptus. To add a dark tone to anchor all of the dusty neutrals, I chose a wine accent in cotinus foliage, black knight scabiosa, and lacey daucus carota. 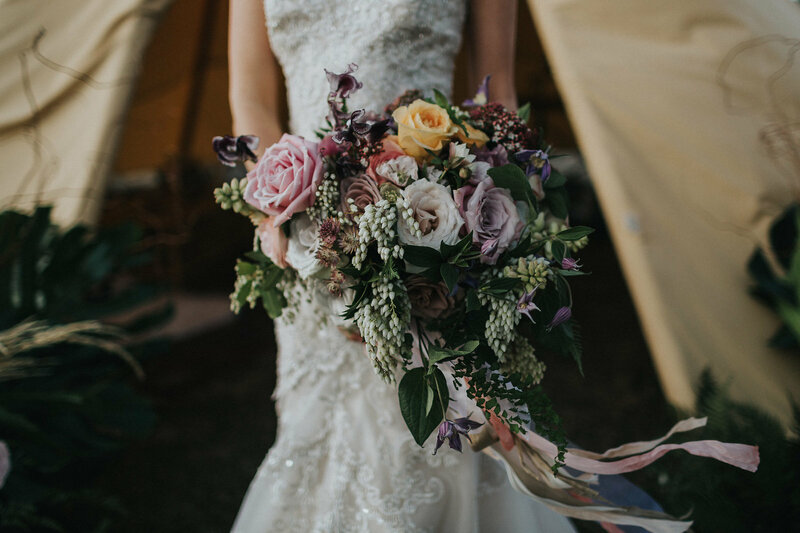 Danielle’s bouquet was organic with multiple layers of yummy ruffled blooms punctuated by gestural foliage and finished with tonal silk ribbons of varying lengths and widths, all inspired by the lace and silhouette of her gown. Their ceremony site was a majestic tree next to a quiet fishing pond by the horse stables. To honor the beauty of the tree and the landscape we kept their ceremony florals simple and chose to flank the aisle with large arrangements of textural wild foliages and a select number of blooms. 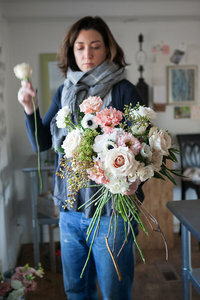 The goal was to make it look as though the arrangements had grown from the ground. Guests dined in Brasada’s Barn, on both reclaimed wooden farm tables decorated with lush, textural garlands that extended down their length, and round banquet tables topped in luxurious brocade linens and finished with wild romantic arrangements in brass compotes. The focal point of the room was Danielle & Kurt at their sweetheart table in front of the iconic lava rock fireplace, punctuated by a dramatic installation. I’m so excited that I got a chance to share some of Danielle & Kurt’s magic with you. Aren’t you dying over these pictures and all of their details?! I know I am. What are your favorites? I would love to hear.